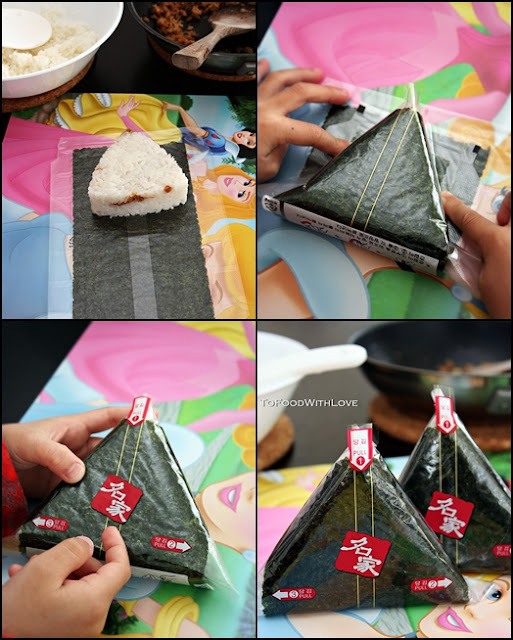 My Korean friend showed me the triangular-shaped seaweed-wrapped kimbap (Korean sushi) that she made for her little boy's lunch the other day. She explained to me how she made the filling using canned tuna, and I was quite impressed to see a home-made kimbap. I usually just buy them from the food court when Z has a craving for sushi, but those are the Japanese version called Onigiri. The fillings are slightly different, being that the Korean ones usually contain tuna or kimchi. I was thinking, gee, her little boy sure is lucky to have such a delightful looking lunch, and made me want some too! So during my trip to the Korean supermarket the other day, I grabbed a packet of seaweed specially for making samgak gimbap, which came with the triangular rice mould as well. I also bought some quality Nishiki rice for sushi, as I found that generic short-grained sushi rice had a grainy texture that didn't hold together so well, and didn't taste as good either. Making this is really easy, especially when you have the mould, all you need to do is fill it up with the rice and tuna, then press it down to form a triangle. But you can just shape it using clingwrap if you don't have the mould, and wrap it with a regular sheet of seaweed that has been cut in half. Please find the recipe after the jump. Heat up the vegetable oil and fry the garlic and onion (if used). Then add tuna, soy, sugar and pepper, and sautee on medium heat until dry and flaky. Add sesame oil and sesame seeds and toss to mix. Remove from heat and let it cool. Assembling the kimbap: Lay out the seaweed per instructions on packet. Place the mould on the seaweed and fill it with 3 tbsp rice. Spoon some tuna in the centre and top up with more rice. Press it down firmly with the mould lid, and slowly remove the mould. Wrap the rice in the seaweed to form a triangle and secure with stickers provided. There are videos on youtube that show you how to do it. Click here to view. These are great for picnics and lunchboxes. The seaweed is kept fresh and crispy until the plastic wrapping is removed when ready to eat. Z loved it so much that he had it for lunch, dinner and again for his school lunchbox today! Ooh they do look good. Depends on where you are. I've seen them at Korean supermarkets before in the fridge section.